The recent release of the Next Generation Science Standards (NGSS) offers a new challenge and opportunity for science. Science practices are the social interactions, tools and language that scientist use as they construct, evaluate and communicate scientific knowledge. The effective integration of science practices into classrooms can better support a wide range of students, including those typically underrepresented in science, to develop greater scientific literacy. Effective integration of science practices in classrooms requires instructional leadership to support that change. Instructional leaders can include a variety of different individuals including, but not limited to, school principals, district leaders, coaches and lead teachers. The ILSP team is developing tools to support instructional leaders in the science practices. Our vision for supporting instructional leaders in their work with teachers to improve science teaching and learning stems from our approach to instructional supervision and science instruction. 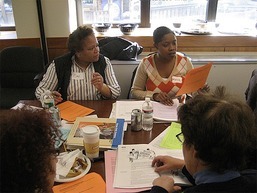 ​Our orientation to supervision is rooted in the importance of strong instructional leadership. We seek to support leaders in their work with teachers as they promote a growth mindset, foster frequent and ongoing opportunities for feedback, sustain a commitment to teacher development over time, and engage in collaborative practices. Our perspective on science instruction emphasizes the importance of engaging students in the science practices. In order to support students in these practices, teachers develop classroom learning environments that are collaborative, student-directed, language rich, focused on scientific evidence, and connected to the natural world.